U.S. Army General Robert Abrams (L) testifies during his nomination hearing to be commander of all U.S. forces in Korea, on Capitol Hill in Washington, Sept. 25, 2018. The U.S. general nominated to be the next commander of American forces in South Korea said the suspension of a major joint military exercise between the United States and South Korea has caused "degradation" to military readiness on the peninsula. After an unprecedented summit with North Korean leader Kim Jong Un earlier this year, U.S. President Donald Trump announced Washington and Seoul would not conduct their annual Ulchi-Freedom Guardian exercise, one of the largest military exercises in the world. "That’s a key exercise to maintain continuity and to continue to practice our interoperability, and so there was a slight degradation," Army Gen. Robert Abrams said Tuesday at his Senate confirmation hearing. The general added, however, that he felt the cancellation was a "prudent risk" for the effort to "change the relationship" with North Korea. When asked by Democratic Senator Gary Peters how many large-scale exercises could be skipped before a "significant decline in readiness," Abrams said it was "hard to judge." "If confirmed, this will be one of my top priorities when I get on the ground on the pen[insula] to do my own personal assessment," Abrams said. In the meantime, he said he was confident with the current U.S. Forces Korea commander's mitigation plan to sustain readiness until major exercises resume, which included U.S. and Korean participation in exercises that are smaller in scale, scope and volume. Abrams said the U.S. military was "proceeding with planning" a large-scale exercise scheduled about six months from now on the Korean peninsula, but he cautioned execution of the exercise would be a "decision by our alliance leaders." The U.S. conducts two major joint exercises with South Korea each year. The first large-scale exercise, Foal Eagle, was pushed back this year so it wouldn’t clash with the Winter Olympics. 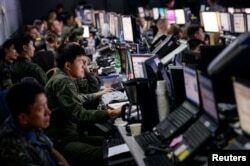 Ulchi-Freedom Guardian, which had been scheduled for August before it was canceled, typically includes almost two weeks of drills for about 17,500 U.S. troops and 50,000 South Korean troops. U.S. Defense Secretary Jim Mattis has said the decision to cancel some exercises with South Korea was made in order "to provide space for our diplomats to negotiate the verifiable, irreversible and complete denuclearization of the Korean Peninsula." Asked Monday whether North Korea disarmament was possible, Mattis told reporters, "It's going to be a long road, hard road, but I'm still thinking we're on the right track."